The principle of laser embroidery is that the laser emitted by the laser is controlled by a stable galvanometer. The perforation on each fabric shows a fashionable and trend-setting effect. It is essentially different from the effect embroidered by the embroidery machine. Today, let’s talk about the application of laser cutter in fabric embroidery. First of all, from the perspective of the pattern, the embroidery machine embosses a line of different colors on the surface of the fabric, and the color blocks are combined into a pattern. The “laser embroidery” is handled according to the background color of the fabric. Through the layering method of the laser control system, the fabrics of the same color are embroidered with different shades of color in the background of the fabric, and the transitional color with layering is the natural transition color in the background color of the fabric. Other designers can’t match, with a natural, rustic style. Secondly, from the point of view of performance, the embroidery machine is limited by the characteristics of its work, and the large-format pattern of single lines cannot be continuously expressed. The “laser embroidering” is just complementary to the embroidery machine because of its slim, high-speed, and continuous engraving. The laser-opening graphic women’s clothing that has just been popular this summer has a certain effect by directly forming a graphic by laser drilling. Although the unit price of processing has increased to 10 to 20 yuan, it is still in short supply. Fashionable products must be new and popular. At present, we also apply this technology to the denim processing industry, making a variety of samples such as images, flower shapes, and cats on the denim. Laser bleaching is based on the advantages of energy saving and pollution-free. It is believed that the process of denim blasting will be gradually replaced in the near future. 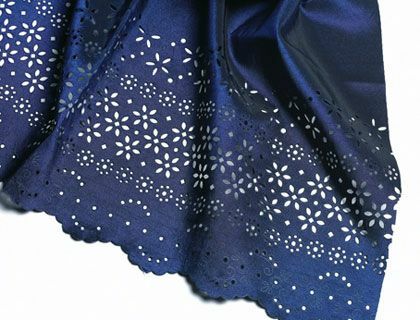 In laser cutting applications, the appliqué of the embroidering process is being transferred from the traditional die-cutting method to the laser-cutting of the easy-to-control pattern. Compared with the cutting of the die, the laser cutting and cutting material has the advantages of no need for the slit and arbitrary output of the pattern. However, the single-head laser cutting and unloading can not meet the production requirements of large-scale embroidery factories, so a laser engraving machine with a good multi-head effect has been introduced. It can not only cut the blanks in small batches, but also can process the chips in large format, which is quite applicable. In addition, in the trademark manufacturing industry, the laser edge cutting process is gradually replacing the traditional manual hot cutting process. It can be said that the market prospect of laser application in the apparel industry can be said to be limitless. Laser cutting machine ,there are more and more factories choose it in the market ,because of high cutting quality ,safe cutting technology .However,there are also many people do not know should choose laser cutting machine or not ,they do not know specific application industries.Now I will help you to solve this problem,tell you specific applications industries of laser cutting machine. Sublistar laser engraving & cutting machine has been applied into the advertising industry, with high accuracy, fast speed, smooth incision, narrow kerf and exact curve fitting. It is suitable for cutting acrylic materials, advertising LOGO inlay, precision machining, engraving duotone breast plate, enterprise licensing agent, licensing authority and medal. With beautiful effect and low cost, it can save man hours and realize perfect combination of engraving and cutting in the advertising industry. Sublistar laser takes the lead in this industry by virtue of individualized operation platform, advanced DSP digital control technology, convenient USB data transmission applications and other advanced technologies. Laser is more and more widely applied into the automotive and aviation industries. Sublistar laser marking equipment can be perfectly applied into the industry of arts & crafts made from a variety of materials, such as bamboo & wooden crafts including chopsticks and writing brushes; gifts, greeting cards; gold & silver jewelry, trinkets, wine box, etc. At present, food and beverage industry require marking brand, nutrition information and shelf life on products. The Sublistar laser solution can help the industry obtain fast and efficient laser marking with low cost. Laser application has been known as the best mode in the leather shoemaking industry instead of traditional handicraft. Sublistar laser equipment can quickly engrave, cut and hollow out all kinds of patterns on various leather materials, and also can conduct engraving of non-penetrating blind slot to obtain the diversified magical patterns with different depths, different textures, obvious levels and color transition, which greatly enriches traditional processing techniques and styles.